Shade gardens can be lovely, relaxing spaces. Check out our tips for making the most of yours! 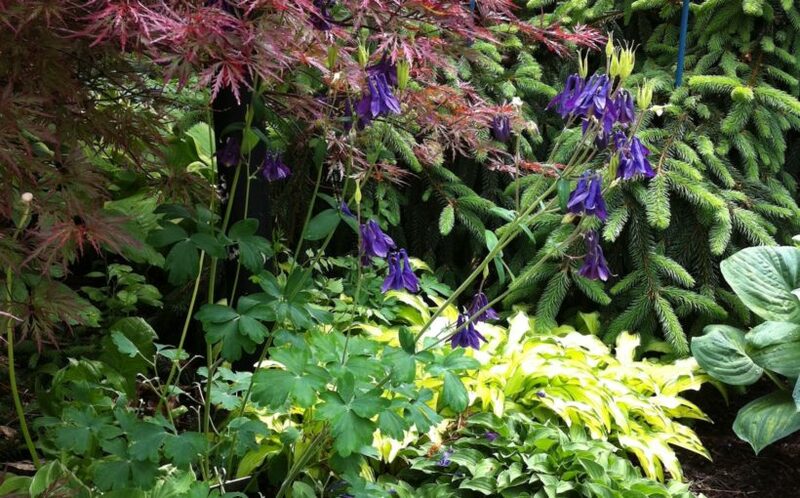 The appeal of most shade plants lies not in their blooms but in the rich range of colors and shapes of their foliage. Play with texture by planting smooth, shiny pigsqueak (Bergenia cordifolia) next to feathery Astilbe species, or mix ferns with the broad shapes of foamflower (Tiarella). Up the color contrast by mixing silver-blue Siberian bugloss (Brunnera macrophylla ‘Jack Frost’) into the hostas or by using blue and yellow hostas next to each other. Speaking of color, using chartreuse or white lightens up shady spots. Our favorite whites for shade are the blooms of astilbe, anemone, and oak leaf and panicle hydrangeas. For a pop of yellow-green, you can’t beat Japanese forest grass or heucheras. 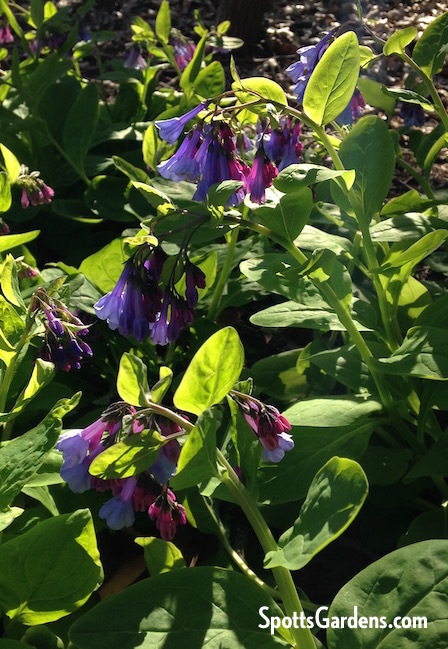 Virginia bluebells are one of our favorite spring ephemerals—and they’re native to Indiana! Most shade plants prefer a rich, organic soil. After all, they come from places where fallen leaves have been building forest soil for millennia! So to help your shade garden thrive, add compost or other organic materials to build the soil. We also recommend mulching with chipped leaves, which will break down and further enrich your soil. Just run over the leaves with a lawn mower first; whole leaves can mat and smother your garden plants. Enjoy your plants even more by providing a way to see them up close. A winding mulch path suggests mystery just around the corner. Stepping stones create a textural contrast to the billowing plants. You can soften the path by allowing plants to grow over the edges. 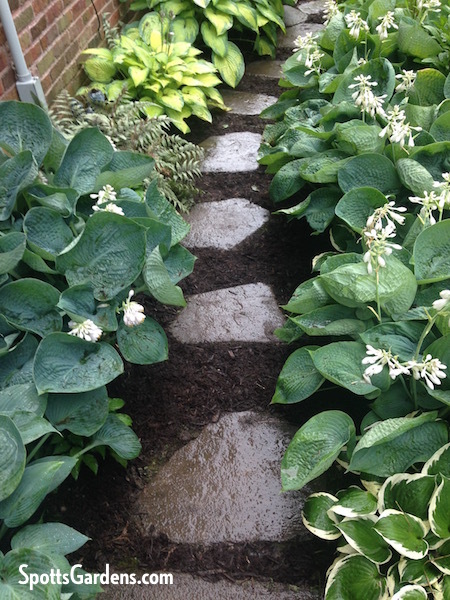 The stones of this path are softened by the hosta that are allowed to grow over their edges. Shade gardens are full of lush, soft texture. Adding something man-made provides hard lines as a contrast. You might use a piece of sculpture, a wrought-iron bench, a birdbath, or some other object to give your garden a focal point. With these tips, you can create your own shady bower and a wonderfully cool spot to enjoy the summer! Your shade garden can be even more beautiful!